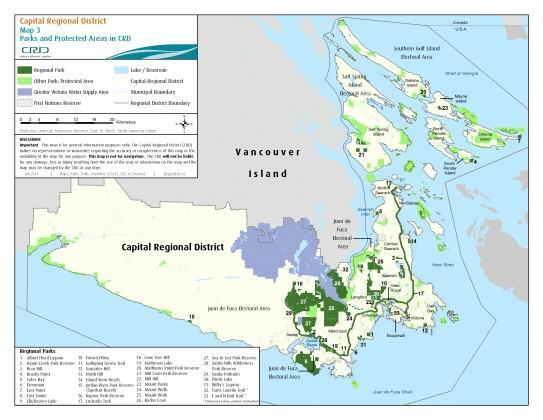 Since 1966, the Capital Regional District (CRD) in British Columbia, Canada (Map 1 below) has developed an outstanding park and trail system, which today is perhaps one of the finest regional park systems in North America [Note 1]. 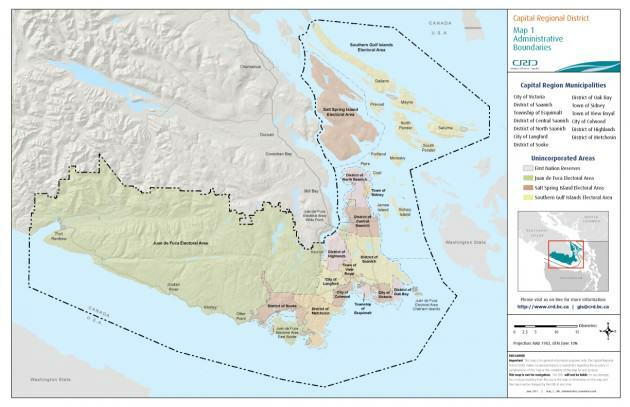 Primarily a natural areas system encompassing three biogeoclimatic zones (Map 2), CRD Regional Parks comprises 33 parks covering more than 33,000 acres and three regional trails extending more than 110 kilometres (Map 3). CRD Regional Parks recently prepared a new strategic plan (Regional Parks Strategic Plan 2012-2021) which sets the direction for the regional parks and trails system over the next decade. The strategic plan defines the long-term “big picture” framework for our regional parks and trails. 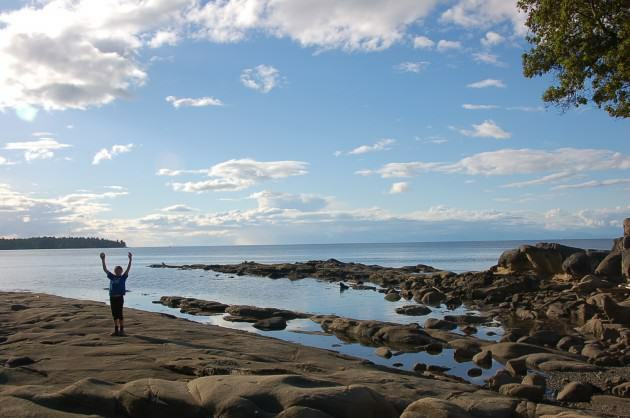 As part of the preparation of the strategic plan, Regional Parks undertook extensive public consultation to find out what was important to people about the regional parks system. What we found was quite surprising – people expect the regional parks system to fulfill a wide range of wants and needs, apart from just a place to spend leisure time. 1 — Politically, the CRD is comprised of thirteen municipalities and three electoral areas (e.g. non-incorporated areas). 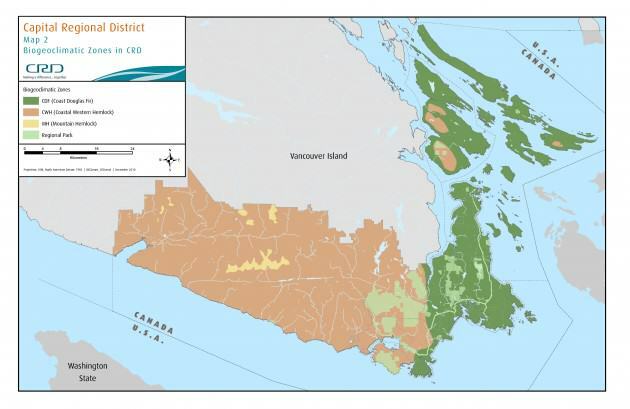 The CRD has a population of about 375,000 and an area of about 245,000 hectares. 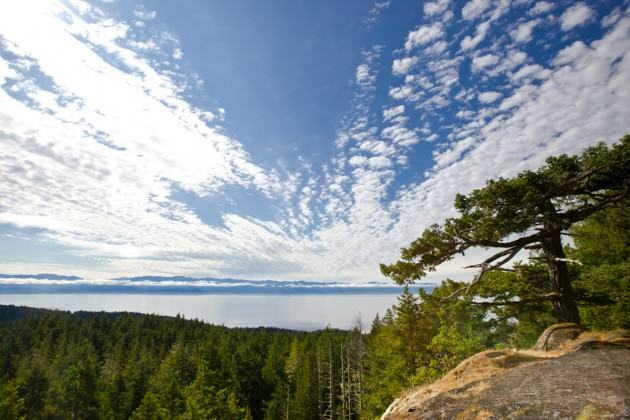 Victoria, the provincial capital, anchors the region’s urban core. Map 1. CRD Administrative Boundaries. Expansive view of the Sea to Sea Regional Park. Photo: CRD Image Library. 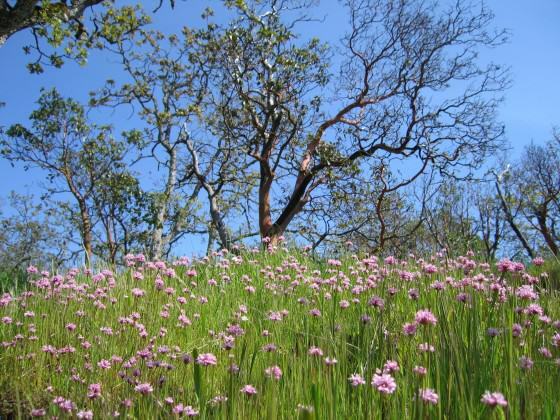 Nationally endangered Garry Oak Ecosystem at Mill Hill Regional Park. Photo: CRD Image Library. Map 3. Parks and Protected Areas in the CRD. 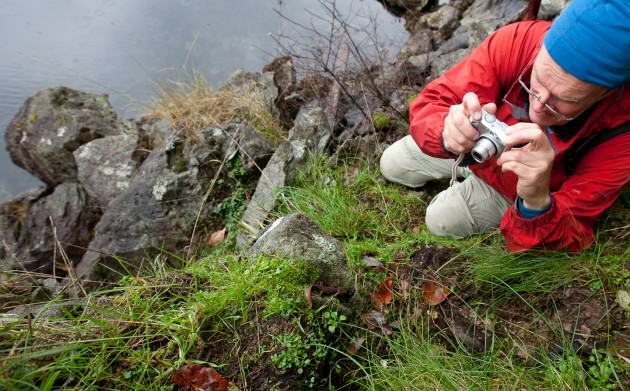 Photographing a rough-skinned newt. Photo: Mary Sanseverino. Citizen involvement in the development of the strategic plan was an essential component of the planning process. To this end, a comprehensive public engagement strategy was developed to provide opportunities for regional residents to contribute their ideas into the preparation of the strategic plan. The information received during the consultation process highlighted participants’ strong beliefs and opinions about Regional Parks. Through an analysis of the data, a number of key themes emerged which clearly indicate the public’s high valuing of, and expectations from, the regional parks system. You can see the full public comment report here. 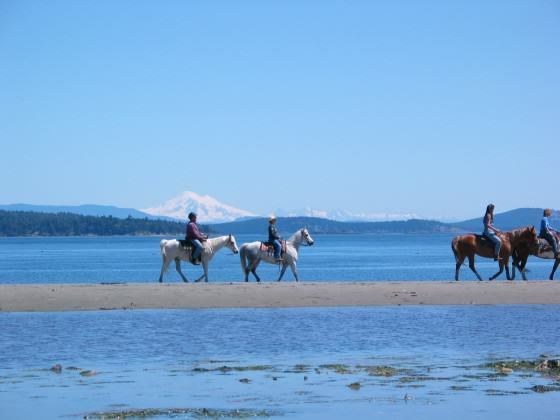 Horseback riding at Island View Beach Regional Park. Photo CRD Image Library. Ten of the most salient themes for urban nature conservation are presented below, in no rank order of importance. 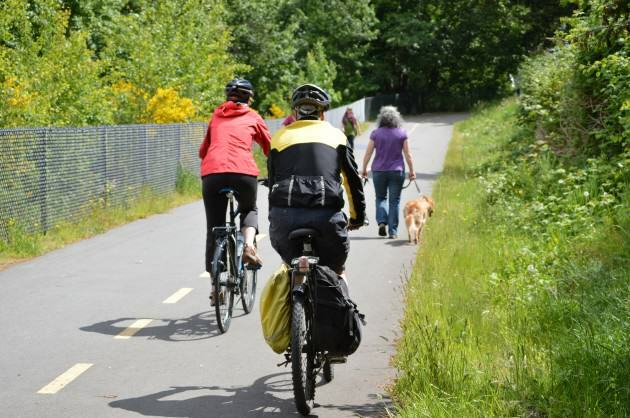 (1) Expand the park and trail network; develop more connections, corridors, and linkages. (3) Maintain biodiversity and ecosystem integrity; understand and monitor what we have, restore landscapes, and address invasive species. (4) Acquire more land while it is still available; target beaches, forests, lakes, rivers, and lands in the western part of the regional district; maintain open space within the urban fabric. (5) Ensure that parks and trails are accessible and in close proximity to all regional residents. “We need to have parks to show our children and grandchildren nature as it used to be”. 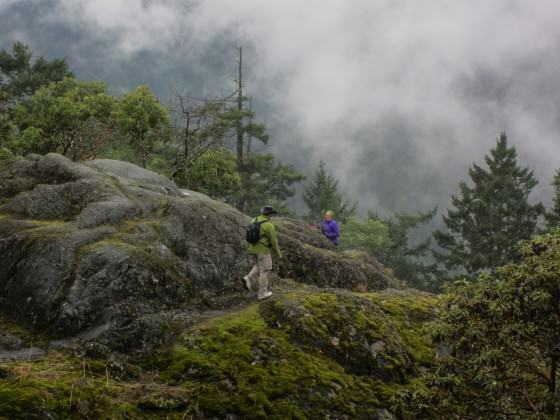 It seems clear that public expectations of regional parks and trails is wide-ranging. And with time, these expectations will likely increase, as the stresses of urbanization, population growth, changing demographics, loss of natural areas and biodiversity, and climate change continue to affect the region. This presents many challenges for CRD Regional Parks, some of which are explained in more depth below. 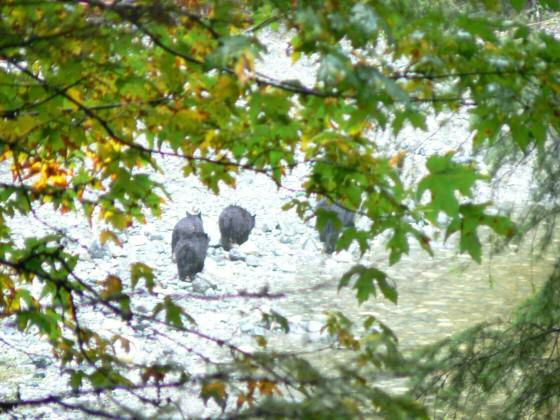 Black bears at Sooke Potholes Regional Park during the fall salmon run. Photo CRD Image Library. Existing parks will become more valuable as places that conserve biodiversity and offer people a place to get away from urban and suburban development. 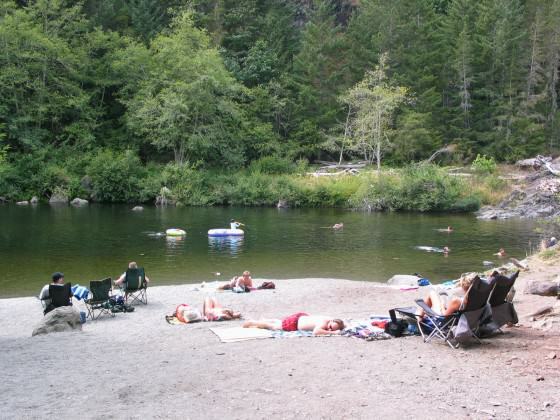 Visitors enjoying a summer afternoon at Sooke Potholes Regional Park. Photo: CRD Image Library. 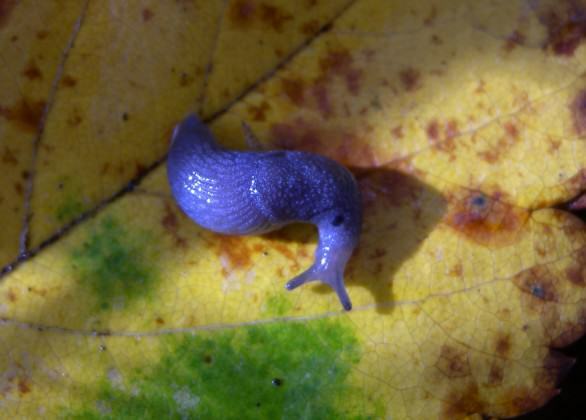 Nationally endangered Bluegrey Taildropper (slug). Photo by Kristiina Ovaska. People visit regional parks to participate in activities such as hiking, walking, horseback riding, cycling, camping, swimming, boating, beachcombing, fishing , nature study, and organized group activities. These activities can be enjoyed year-around and they contribute to a healthy lifestyle. However, this high level of use impacts the very things these visitors come to enjoy. Regional Parks is challenged to ensure a sustainable harmony exists between sound land stewardship and outdoor recreation activities. Hikers on Mt. Wells Regional Park. Photo by Mary Sanseverino. Regional Parks is supported primarily through property taxes, with a 2012 operating expenditure budget of $10,014,290. Regional Parks faces significant funding challenges and effective financial management is essential to ensure the long-term sustainability of the system. The organization must sustain the capacity to operate and manage the system in a fiscally responsible manner, while providing stewardship of natural and cultural resources and built infrastructure, and continuing to deliver excellent services to park visitors. A section of the new E&N Rail Trail in the Capital Regional District. Photo CRD Image Library. In 2000, the CRD Board established a ten-year Land Acquisition Fund at a rate of $10 per average residential household. The fund generated approximately $1.7 million per year to purchase land for regional parks and trails. In 2010, the Board extended the Land Acquisition Fund for another ten years and increased the fund by $2 per average residential household per year, to a maximum of $20 in 2014 through to 2019. The Fund will generate approximately $3.4 million per year at the $20 rate. In 2010, Regional Parks made significant acquisitions of parkland and the financial commitments for those purchases extends to 2015. As a result, Regional Parks will not have significant funds for further land acquisition until 2016. 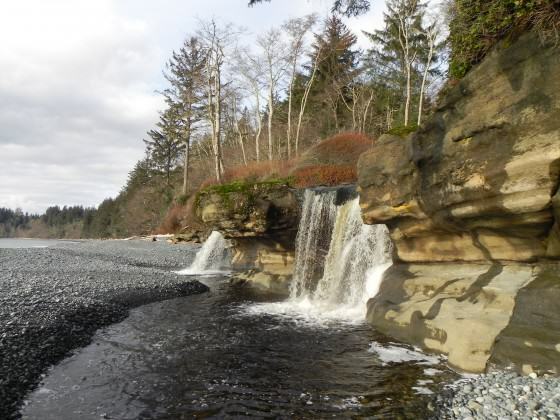 Waterfall at Sandcut Beach in the newly acquired Jordan River Regional Park. Photo: CRD Library. 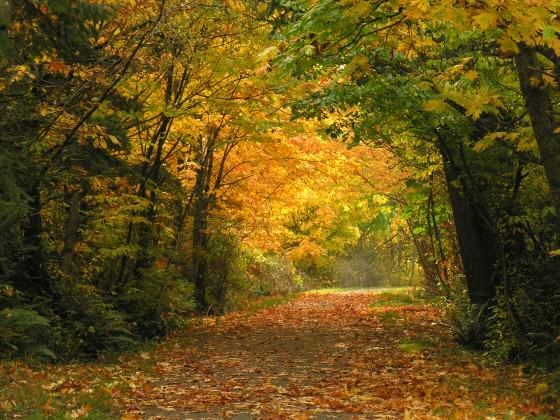 Regional parks and trails help define the regional landscape, and it is important to manage them in the context of their relationship with the rest of the landscape. However, the regional parks and trails system is only one part of the land use planning in the CRD. It is important to manage land use both inside and outside of regional parks and trails boundaries. This is one reason why Regional Parks must collaborate with others involved in land use planning. This collaboration is also critical in establishing landscape corridors in support of biodiversity. A rural section of the popular Galloping Goose Regional Trail in autumn. Photo by Bev Hall. In spite of the many challenges facing Regional Parks, we are very optimistic about the future of the region and the regional parks system. 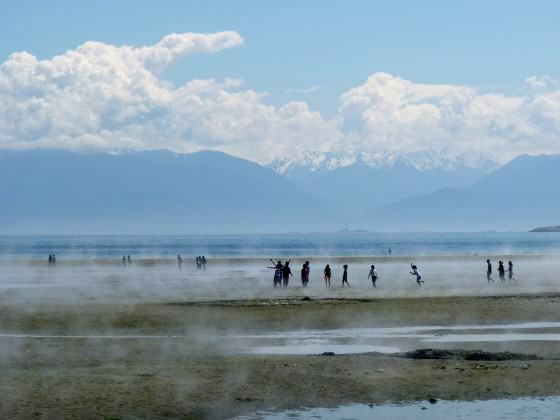 The CRD is fortunate to enjoy high levels of public support for the protection of green and blue space as well as continuing demand for accessible opportunities to connect with the natural world. Regional Parks is committed to providing residents and visitors with a world-class parks system that both protects the environment and provides for outstanding recreational opportunities. This commitment is reflected in the Strategic Plan’s goals for regional parks. (See the Regional Parks Strategic Plan 2012-2021, page 74. 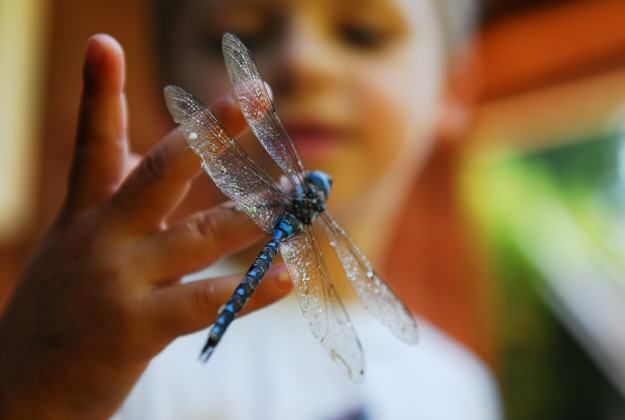 Child with dragonfly at one of CRD Regional Parks’ interpretive programs. Photo: Deborah Kerr. In this century, regional parks and trails will become part of a larger integrated and connected system of natural areas. Subscribing to the idea that “nature needs half”, policies and actions are explored through sustainability planning to significantly enhance the system of natural areas in the region in order to sustain life supporting ecological processes. By conserving at least half of the Capital Region’s land and water base for nature, residents may live and work in harmony with the environment. 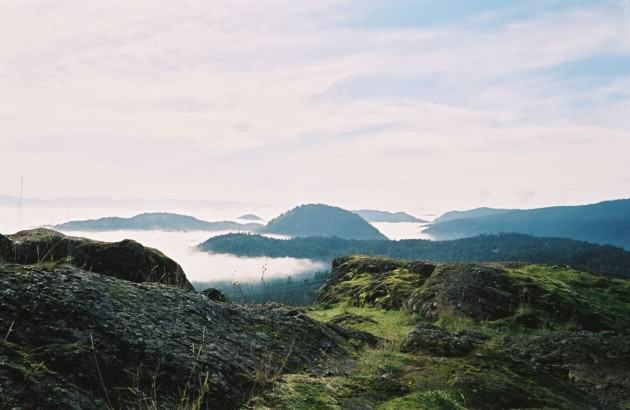 View from Babbington Hill, East Sooke Regional Park. Photo: Mary Sanseverino. 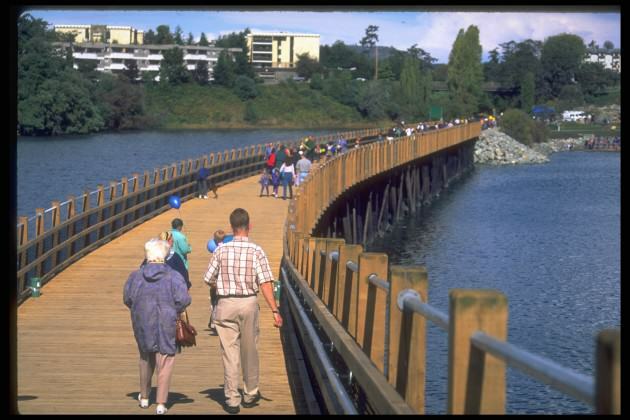 Regional Parks is starting to act on this concept by collaborating with CRD Regional Planning to embed Nature Needs Half as a policy direction in the development of the Regional Sustainability Strategy. This multi-year planning process will result in a comprehensive regional growth management plan that addresses issues such as transportation, population change, settlement patterns, and resource management. Discussions are now taking place to define what “nature” and “half” mean in the context of the CRD, and how this concept can move from idea to implementation over the next several decades. In support of this, Regional Parks has included a graphic long-term vision for completing the parks and trails system in the Strategic Plan (Regional Parks Strategic Plan 2012-2021, pages 79-82). Realizing this proposed system will take time and require innovation, collaboration, financial resources, public support, and political direction. 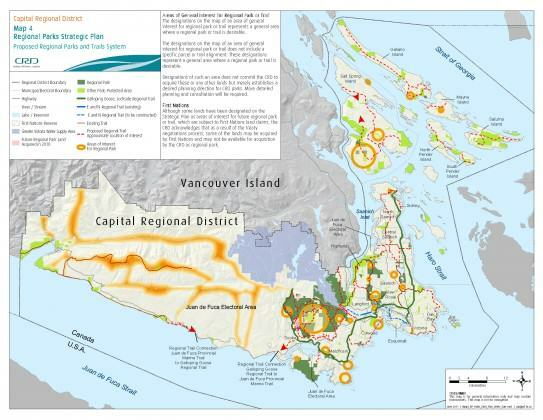 Map 4 shows the proposed system, with areas in orange identifying areas of acquisition interest for Regional Parks. 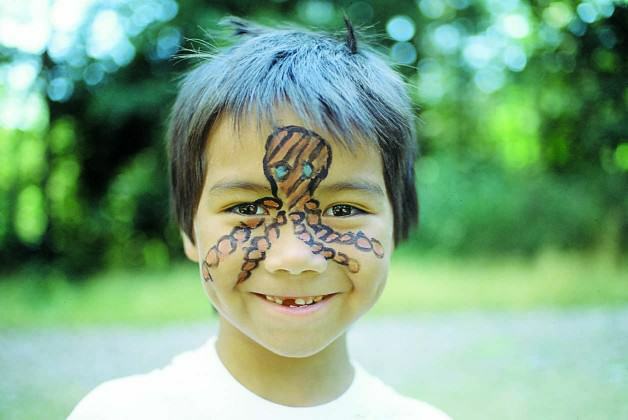 Face-painting at a CRD interpretive event. Photo: CRD Image Library. Proposed Regional Parks and Trails System. 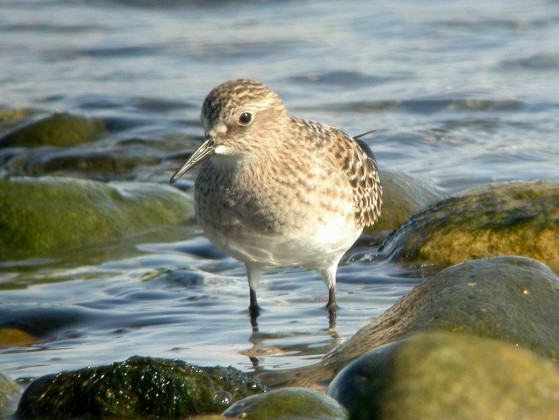 Baird’s Sandpiper at Island View Beach Regional Park. Photo by Dave Appleton. It seems clear that Regional Parks are very important to residents of the CRD and very much a part of their everyday lives — their relevance to the public is high. But, as we have seen, this creates numerous challenges in trying to meet these expectations in an era of budgetary constraints, limited capacity, and changing conditions and demands. Regional Parks has recently developed a comprehensive strategic plan which lays out how we will meet these challenges over the next ten years, and which describes our vision of at least half of the land and water base being managed for nature conservation. With continuing public and political support, we feel confident that we will be able to meet these challenges and continue to offer the public outstanding opportunities to connect with nature close at hand and on demand. Enjoying the day at Brooks Point Regional Park. Photo by Danica Rice. 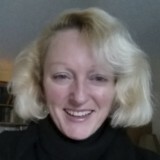 Lynn Wilson (MCIP, RPP) is a regional park planner for a 33,000-acre natural area system on Southern Vancouver Island, British Columbia, Canada. Came across this at a time when I am feeling penned as natural , wooded areas continue to be developed and built over 😀 Think I am suffering Nature-Deficit Syndrome as author Richard Louv calls it in “Last Child in the Woods”. When we moved here 36 years ago there was a wooded area two minutes walk away, fields on another and a long stripe, a natural area we could enjoy. Now if plans go through the last of the sides which had housing built years ago but has a wooded natural area between it and the street that is fairly free of traffic is going to be become a boulevard. That will close us in with housing now on the side that was a two minute walk away wooded area. Years ago a boulevard was built along the long stripe of wooded natural area . Not only that, our park is for summer sports, swimming and ice skating if the weather permits. So not much action for nine months of the year only a big rectangle of sodded ground. The playground is has no shade and is on a big sandbox, so very hot in summer. Yes it has trees and bushes in less than ideal natural areas to walk among , in fact impossible. on the outer boundary of the park but nature in its glory, here has been taken away – thus my gardens especially in the back yard are my haven. There is a wooded area about 15 minutes walk away but there is a busy boulevard between it and us now plus soon it will become a light rail train station and parking lot. How can we expect people to respect, understand and care for nature when it is disappearing around us?